Some newer brands of inhalers have different colours to the traditional blue for reliever and brown or orange for preventer. Read the data sheet for details of your child's inhaler. If you don't have a data sheet, you can find one on the Ministry of Health website Medsafe. When your child is diagnosed with asthma, your doctor will usually give you some medication to try, for example a reliever inhaler and spacer. You and your child will be shown how to use the inhaler and spacer correctly. This is called a treatment trial. If the treatment helps your child, the doctor may decide that your child has asthma, give you more information, and may arrange an asthma action plan. The type of medication they give to your child will depend on how severe their asthma is and how often they experience symptoms. 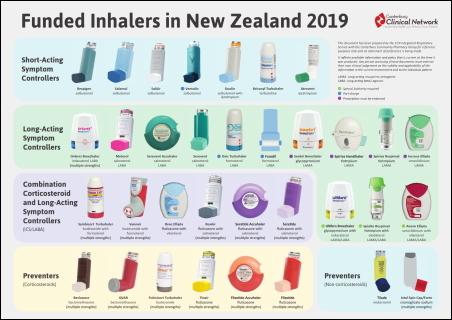 Click the image to the right to see a larger version of the poster showing the inhalers that are available in New Zealand. Children with asthma may have one or more of these types of inhalers. 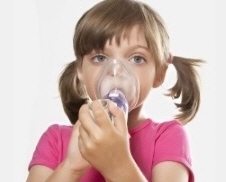 Short-acting relievers – Everyone who has asthma is usually given a reliever inhaler. A reliever inhaler contains a medication called a bronchodilator, which relaxes the muscles in the airways. Your child uses this inhaler to relieve symptoms. They can also use a reliever inhaler before exercising to prevent wheezing. If your child needs to use their reliever inhaler regularly (most days or several times a day once or twice a week) it is important that you see your doctor to look at other asthma treatments. Your child should always have their reliever inhaler with them in case of an asthma attack. Preventers – If your child is given one of these inhalers, it is important to use it every day to keep the airways healthy and prevent symptoms from developing. This medicine in these inhalers is a steroid, which helps to reduce the inflammation and swelling in the airways. Long-acting reliever inhalers – These inhalers are sometimes recommended in children whose asthma is not well controlled by using a preventer regularly. The medicines in these inhalers work for up to 12 hours to keep the airways open. They don't contain steroids but they must be used with a steroid (preventer) inhaler. Combination inhalers – Combination inhalers include a preventer and a long-acting reliever in the same inhaler. Your child needs to use this inhaler every day, but it is not suitable for emergencies. Learn more about inhalers on the Asthma Foundation website, which includes a video showing children how to use their own inhaler. For videos more suitable for older children, or for adults helping children, see the videos in the link below. With some inhalers, using a spacer helps get more of the medicine into your lungs. Many of the newer inhalers are designed to be used without a spacer. A small volume spacer with a mask is used for children who are too young to use a mouthpiece. See Using a spacer for instructions. Oral steroids, which are usually given as either prednisone tablets or Redipred liquid may be given if your child's asthma is going through a bad patch or not settling down. These work quite quickly by reducing the inflammation in your child's airways and are usually taken for three to five days. Oral steroids can have side effects, but usually only if taken over a long period of time. Your doctor will usually discuss this with you, but it is often better to manage bad asthma quickly with oral steroids. These videos show how to use an inhaler (including several different types) and how to use a spacer.